EMR stands for Electronic medical record, which is the systematized collection of patient health information and a digital equivalent of paper records. The EMR represents a medical record within a single facility, such as a doctor’s office or a clinic. EMRs typically contain general information such as treatment and medical history about a patient as it is collected by the individual medical practice. There are numerous advantages of EMR serving as the platform for patient care within a medical practice. Health care is increasingly reliant on information technology and data to drive decisions necessary to achieve a high-quality, 21stcentury health care system. Fueled by the Health Information Technology for Economic and Clinical Health (HITECH) Act, health care organizations have rapidly increased the pace of electronic medical record (EMR) implementations and the amount of digital data available. While the switch from paper to electronic data can be beneficial, there can be unintended negative consequences even among the highest-functioning health care systems. Feedingincorrect information in EMR system causes errors. Even small data errors have measurable effects on a clinical organization’s ability to accurately determine whether it is meeting its operational performance goals. Also, EMRs have quite a large learning curve. It takes some serious time and dedication to learning how to navigate the system after implementation. Accurate patient’s information should be something your EMR provides your physicians. If your staff is spending more time trying to punch numbers into the computer and less time visiting with their patients, that’s a sign your EMR isn’t working the way it needs to be. Because patient care is so important to your physicians, it’s likely they’ll skip the hassle during the visit and work after hours to catchup on patient documentation. This extra time isn’t necessary and could send your physicians into physician burnout. For your medical practice to function productively, it’s imperative that all of your counterparts work smoothly together. In other words, if your billing and insurance companies aren’t integrated into your EMR system, or if your physicians aren’t fully understanding how to use the system, then huge bouts of miscommunication are possible. Also, your EMR system–being electronic–should be able to easily relay the proper information to other systems within your practice or with outside vendors. Much like the inability to effectively communicate between your billing vendors, if you’re having a difficult time communicating between any other systems, it’s time to look into getting some EMR help. It’s suggested that before work smoothly system is even implemented into your practice, you and your staff companies aren’t training to learn how to properly work the system. However, even understanding how whose employees receive months of training, the learnability proper information novice and expert users is quite large. Even the most skilled EMR Much like to be trained regularly on the system due to the changes in if you’re software. In this case, hiring a company that can provide ongoing EMR support may be a great solution. Viaante’s up-to-date and helps to manage clinical medical records and the minutest detailsregarding patients’ healthcare records in the most efficient manner. Viaante Business Solutions is your ideal partner for EMR Management. So you’ve reached out for that EMR help–but no one on your provider’s tech team can seem to help. If it seems like problems keep piling up on you and your staff and you aren’t able to receive much help from your EMR tech support–that could be a sign that something isn’t right. Electronic medical record software is a complex system that requires proper setup and support to run efficiently. If you aren’t getting the help you need, odds are it’s time to look into finding a company that can help you integrate into your system better. If you find yourself dealing with hidden fees or receiving random billing statements from your EMR provider, this could be a sign that your EMR isn’t working for your practice. With all of the aspects that go into ensuring a highly-productive EMR, the last thing you want to worry about is extra charges you weren’t aware of. If this is happening to your practice, it may be time to reconsider your provider. Like we mentioned before, all that extra time you and your physicians spend on correcting mistakes or charting patient records is contributing to more stress which can eventually lead to burnout. There’s no doubt that you already work hard and that you love what you do, but getting overwhelmed with EMR by spending too much time trying to do your day-to-day tasks is yet again another sign that your practice needs help with your EMR. Whether your EMR setup was poorly implemented, your staff isn’t properly trained on your software, or you EMR just doesn’t function the way it should–don’t lose hope yet. There’s a way to get your practice up and functioning the way it should. If you have noticed any of thesigns listed above, it may be time to consider looking into support for EMR in your practice. Viaante Business Solutions is your ideal partner. The key to implementing an EMR and securing these meaningful use benefits for a small family practice or large medical facility is to have a solid EMR implementation plan in place. This plan should begin with the selection of a solid service provider, and conclude with ongoing post EMR implementation management and system refinements. By implementing EMR, patient data can be tracked over an extended period of time by multiple healthcare providers. It can help identify those who are due for preventive checkups and screenings and monitor how each patient measures up to certain requirements like vaccinations and blood pressure readings. EMRs are designed to help organizations provide efficient and precise care. Perhaps the most significant difference is that EMR records are universal, meaning that instead of having different charts at different healthcare facilities, a patient will have one electronic chart that can be accessed from any healthcare facility using EMR software. EMR applications can also boost the quality and safety of patient care. With an EMR system, you can prescribe and order medication for patients online more safely as you will know if the patient was prescribed any medication from another physician. You can also immediately know each patient’s medical problems and any allergies they may have. With such detailed information available at your fingertips, your staff can more easily give your patients the safe, efficient and personalized care that they deserve. 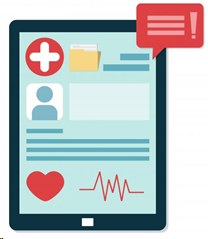 Post the implementation of EMR; you may actually experience a decrease in overall expenditure. The decision to use an EMR system instead of paper records can result in a positive return on your financial investment, according to a study published in The American Journal of Medicine. In the study, providers saved on drug expenditure, improved efficiency in radiologic diagnostics, upgraded the recording and reporting of billing services and decreased billing errors. Viaante’s up-to-date and sophisticated technology helps to manage clinical medical records and the minutest details regarding patients’ healthcare records in the most efficient manner. Most medical offices have had computerized Practice management (PM) systems for many years, regardless of whether that office maintains paper medical records, electronic health records (EHRs) or a hybrid of these two. We have a ready team that specializes in multiple billing platforms likeE-clinical works, Allscripts, Health Fusion, Practice suite, G Med, NUMed etc. This makes the transition a lot easier and quicker for billing companies and Medical groups who are facing challenges and would like to offload their complex work as quickly as they can. PreviousPrevious post:ALL ABOUT PRIOR AUTHORIZATIONSNextNext post:WHY OUTSOURCE MEDICAL TRANSCRIPTION?